This article has been sitting in the “draft” folder for a while. I’ve written, lectured, and pontificated many times about my position that dentists should be creating their own website content. I’m not saying they need to create the actual website. I’m talking about the CONTENT. Content is king. I’ve said it a googol times (pun intended)! But, this article is about a different angle on content. 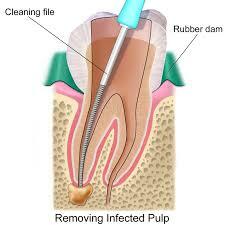 The reality is that most dental websites are chock-full of canned content provided by the website developer. Aaagh! Patients do NOT want to see this! Besides not contributing to the content, many dentists may not even know what’s in their own website. They wanted a website and wrote a check. They may have taken a quick look at their own site. They probably sent a link to their friends and their moms. They also took a quick peek and marveled at how “nice” it looks. And, most of them DO look “nice.” They’re pretty. They have cool special effects and pleasing color schemes along with the same stock photos of that pretty blond girl. 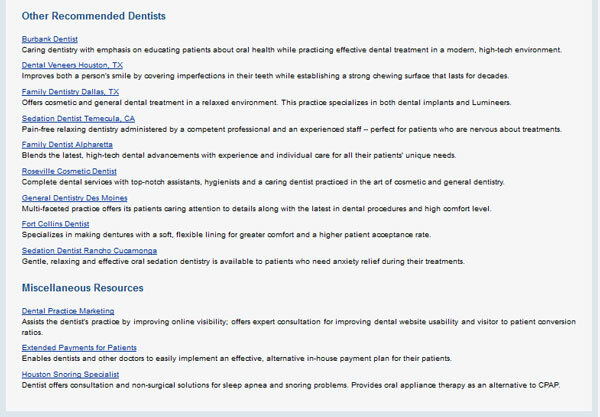 I once found a website that had the references to the dentist… by another dentist’s name! They had the wrong name and the wrong city. It was apparently a boilerplate site, but the website “developer” forgot to change the name and location! But, what’s REALLY in their websites? Does the content reflect the dentist’s philosophy? Personality? Style of practice? Style of communication? If the dentist actually looked at EVERY page, would he or she approve of the content? Is it congruent with his or her practice? Now that I’ve got you thinking about those seemingly benign questions… What if there was something more nefarious buried in your site? Hiding in plain sight? What if your web developer put something in there that was self-serving? What if there was something in your site that served to benefit the developer’s OTHER CLIENTS? And, you didn’t know it? You weren’t asked or told? How would you feel? Well, maybe you should take a look. Where do all your site’s links go? What’s in your site? Have you REALLY looked? I clicked on the “Resources” link (pink arrow in previous image) buried in the “footer” of this site, and it led me to this page of links. Let’s scroll down (see next image). Scrolling down, we find links to other dentists’ websites and even some self-serving links to the marketing company that developed the site. So, what’s the harm here? Maybe no real harm. But, I wonder if the dentists know that these links are contained in their websites? If they were told, then I don’t find any ethical issue. Whether it’s an effective link-building strategy is debatable. And, whether it “leaks” page rank is also debatable. 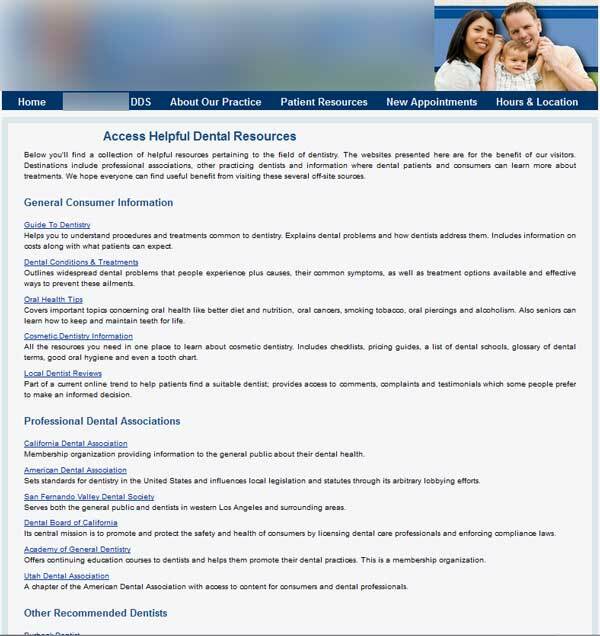 The bottom line is that Dental Warriors should know what’s REALLY in their practice websites. This entry was posted in Marketing, Websites and tagged dental website content, dental website links. Bookmark the permalink. 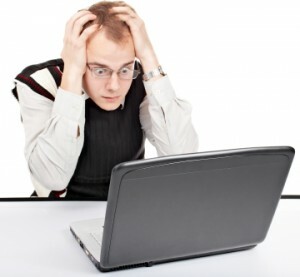 4 Responses to Do You Know What’s in Your Website? Are You Sure? Going to take a LONG look over my website tonight. Very appreciative of this blog and helping remind one to STOP and take a look around and ensure the “details” are up to snuff. I found a broken link on my site, had the developer do a fix however need to take a closer look at the rest. I also would like to keep my page “updated” just not sure what to use to keep it “current” and not stale? Interesting read. 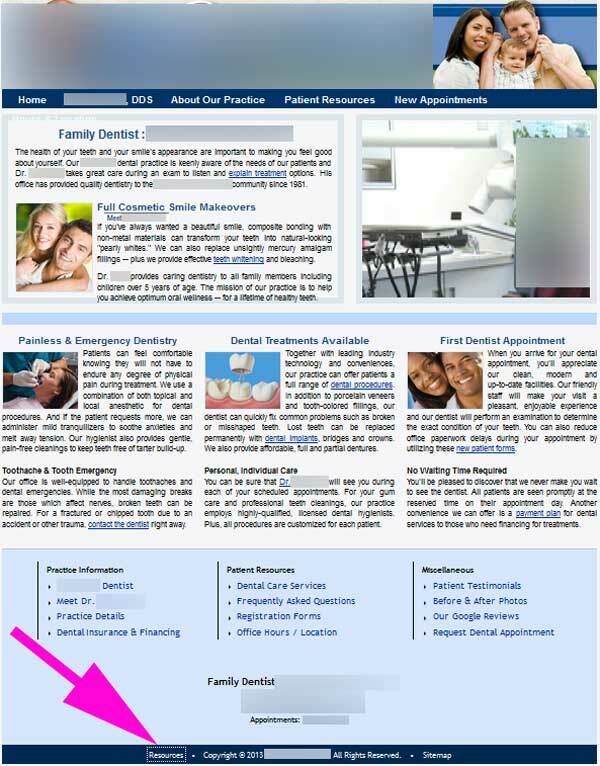 A dentist should at all times be aware of what is there on his/her website. It is a great idea to list all the services and practices, since many patients may be looking for information before coming in for an appointment. Consider the website a part of your identity and a medium through which your clients can get to know your better and have more confidence in your capabilities. I see other dentists’ blogs with duplicate content all the time. I can’t believe in 2016 so many people still don’t know this is such a big issue..I hope they figure it out one day. Also blogs are really great for engaging with the community and even just writing some interesting things about dentistry that people might want to read. I like to try to focus on things that my community might be interested in too. This is great information for anyone running their own practice and maybe leaving their website to flounder out there against their competitors!